Jeff Koon art for sale and sold in recent times. 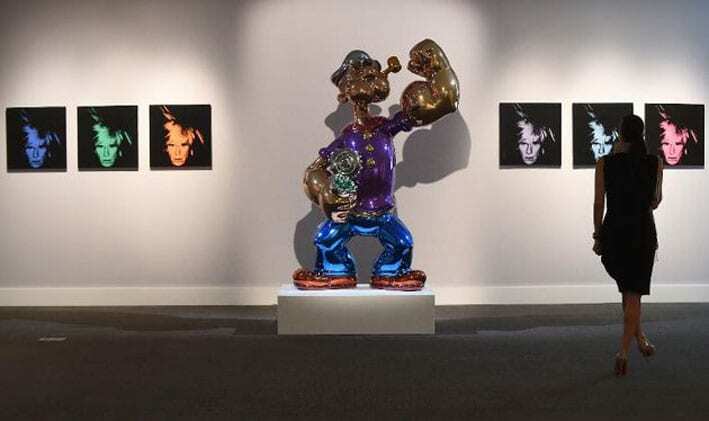 Popeye by Jeff Koons displayed at Sotheby’s in New York on May 2, 2014, new owner Stephen Wynn paid 28million Jeff Koons only created 3 of the Popeye statues. 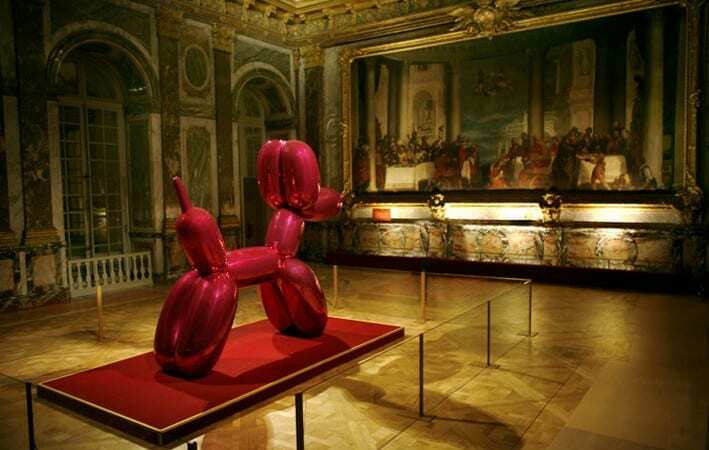 Another of his works, Balloon Dog, was auctioned for a staggering $58 million last year, making it the most expensive piece of art sold by a living artist. 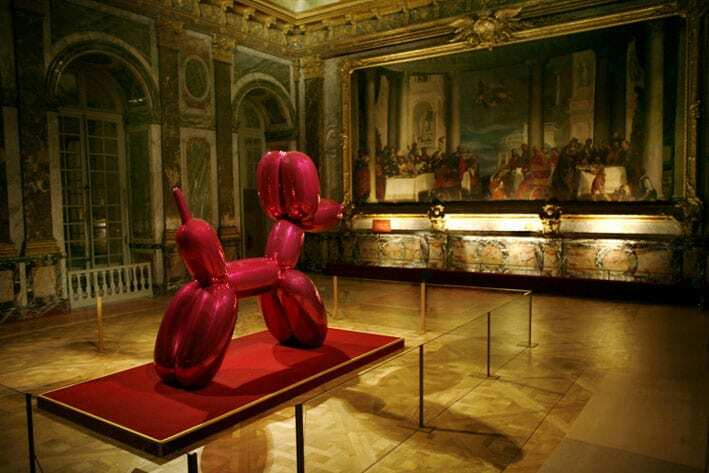 Pink Balloon Dog photographed on September 9, 2008, at the Château de Versailles.Balloon Dog (Magenta), 1994-2000, mirror-polished stainless steel with transparent color coating, 121 x 143 x 45 in. (307.3 x 363.2 x 114.3 cm),François Pinault Foundation. One of five unique versions (Blue, Magenta, Orange, Red, Yellow). The Orange version was sold in 2013 for a record price for a living sculptor. Jeffrey “Jeff” Koons (born January 21, 1955) is an American artist known for his reproductions of banal objects—such as balloon animals produced in stainless steel with mirror-finish surfaces. 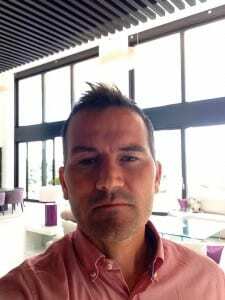 He lives and works in both New York City and his hometown of York,Pennsylvania. His works have sold for substantial sums of money, including at least one world record auction price for a work by a living artist. On November 12, 2013, Koons’s Balloon Dog (Orange) sold at Christie’s Post-War and Contemporary Art Evening Sale in New York for $58.4 million, above its high $55 million estimate, becoming the most expensive work by a living artist sold at auction. 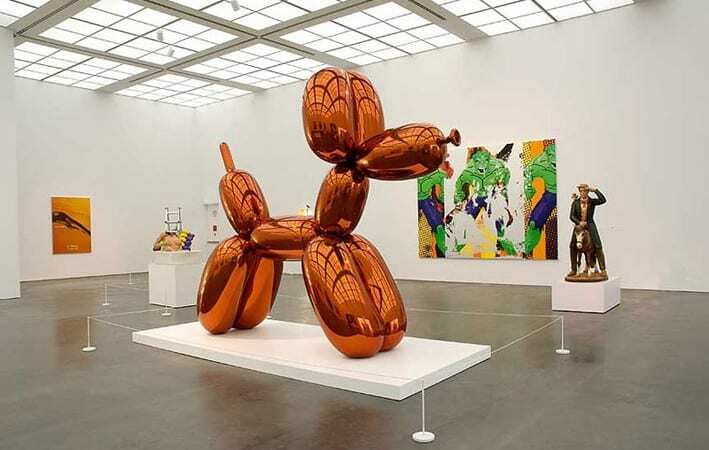 The price topped Koons’s previous record of $33.7 millionand the record for the most expensive living artist, held by Gerhard Richter, whose 1968 painting, Domplatz, Mailand, sold for $37.1 million at Sotheby’s in May.Balloon Dog (Orange) was one of the first of the Balloon Dogs to be fabricated, and had been acquired by Greenwich collector Peter Brant in the late 1990s. Please contact me,if you wish to buy or sell a art work by Jeff Koon. 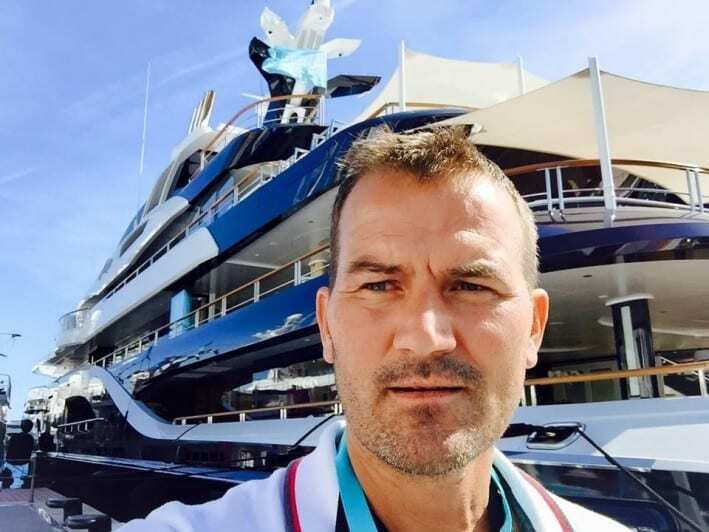 I represent very wealthy Buyers and Sellers. auction and private sales Jeff koon, Jeff Koon art for sale and sold in recent times.